We’d love your help. 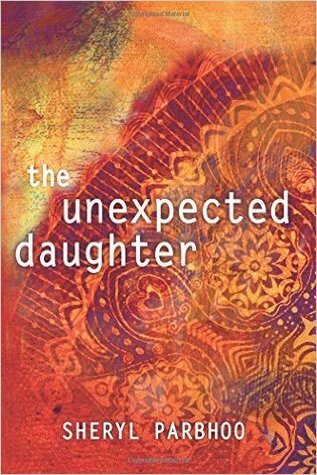 Let us know what’s wrong with this preview of The Unexpected Daughter by Sheryl Parbhoo. To ask other readers questions about The Unexpected Daughter, please sign up. Giveaway on my blog starting Monday, May 1, 2017 Book Nation by Jen https://booknationbyjen.wordpress.com! Enter next week for a chance to win a copy of this great book! I loved this story, enjoyed following each character as they fought their own personal battles and learned a lot about Indian culture and tradition along the way! Roshan and Jenny have a unique friendship that grows into more but they resist the temptation to commit, he due to his Indian background, customs and parental influences Giveaway on my blog starting Monday, May 1, 2017 Book Nation by Jen https://booknationbyjen.wordpress.com! I was surprised to find myself as emotionally invested in the characters as I was...Plus, I learned a lot about Indian food/culture! The author has a great knack for painting vivid images. Have we heard the last from Wanda?! Could Bollywood make this into a movie?! I was very fortunate to win a copy of this book in a Goodreads giveaway. We read books for many different reasons. We read for entertainment, to escape reality for awhile, to educate ourselves, for comfort and for inspiration. The Unexpected Daughter is written in a way that will fulfill any reader's reason for choosing to read it. There is a message of family, love, courage, compassion & tolerance amidst pain, loss, ignorance & emotional struggle. The story follows main characters Roshan I was very fortunate to win a copy of this book in a Goodreads giveaway. We read books for many different reasons. We read for entertainment, to escape reality for awhile, to educate ourselves, for comfort and for inspiration. The Unexpected Daughter is written in a way that will fulfill any reader's reason for choosing to read it. There is a message of family, love, courage, compassion & tolerance amidst pain, loss, ignorance & emotional struggle. The story follows main characters Roshan, his mother, Esha and Jenny. Roshan and Esha immigrated to the United States from India when Roshan was young. Jenny grew up in the South. Each escaped from family struggles to try to start new lives and leave all the drama behind, but was it possible? Esha raised Roshan in a culturally traditional home. Family had been woven into a beautiful tapestry with their traditions and beliefs. However, when Roshan and Jenny choose to begin an inter-cultural relationship that tapestry begins to unravel with feelings of betrayal, abandonment, anger and shame. An interesting collection of complex characters who drive you crazy with their decidedly human flaws- just like real people in real life. I was pleased that the 3 main characters were not paragons of virtue and were presented "warts and all". The evolution of the relationships over time, through trying circumstances and challenges and from different cultural perspectives, kept me interested throughout the book. I enjoyed the author's writing style quite a bit although I was distracted by numerous An interesting collection of complex characters who drive you crazy with their decidedly human flaws- just like real people in real life. I was pleased that the 3 main characters were not paragons of virtue and were presented "warts and all". The evolution of the relationships over time, through trying circumstances and challenges and from different cultural perspectives, kept me interested throughout the book. Interesting plot but unfortunately the writing didn't live up to my expectations. The best parts were the author's wonderful descriptions of the delicious sounding Indian food. And the introduction of the cultural mores involving arranged marriages and caring for/pleasing ones family were interesting. But characters were shallow and dialog fell flat many times. I would have rated it higher if not for the plethora of typos. Seriously, about every 4 pages contained a typo. Really wonderful book! Great storytelling and engaging characters. I highly recommend this one. Enjoyed this book until the end. It was a good read. So sad how it takes so long for us to realize we need help. This books shows us how important it is to accept others as they are. It took me a while to run this book. the guy in this book just was himself. they should have gotten out of the marriage before it started. So sad!! Sheryl Parbhoo is an author and blogger. A native southerner, her interest in culture led to a B.A. in Anthropology from the University of Memphis. Her longing for the spice of life culminated when she married her high school sweetheart, a South African Indian immigrant, and became a stay-at-home mom to their five children for over 20 years. Sheryl has blogged for years about her spicy masala/sout Sheryl Parbhoo is an author and blogger. A native southerner, her interest in culture led to a B.A. in Anthropology from the University of Memphis. Her longing for the spice of life culminated when she married her high school sweetheart, a South African Indian immigrant, and became a stay-at-home mom to their five children for over 20 years. Sheryl has blogged for years about her spicy masala/southern cornbread way of life, raising her large multicultural family, and navigating the quirks of Southern and Indian in-law relationships. These, along with the responses received from readers, are the real-life inspirations for her novel, The Unexpected Daughter.